spiders | Notes from the U.K. Someone abandoned a box of Brazilian spiders in a parking lot in Derbyshire (which, irrelevantly, is pronounced Darbyshire, not that the spiders cared). The were big spiders. Or at least they were baby spiders that will grow big enough to eat birds, something I know because they’re called Brazilian bird-eating spiders. If that isn’t enough to freeze the blood of an arachnophobe, they’re a kind of tarantula. You can stop reading now if you’re going to have nightmares. If you’re not going to sleep at all, you can stop reading a couple of paragraphs ago. The box was hit by a car, or “a vehicle” as the articles I’ve read put it, which could mean a car and could mean a truck, a tractor, a motorcycle, a kid’s scooter, or a skateboard. I think those last two are vehicles. Anyway, the box was hit by something with wheels and the driver told a woman in the parking lot that he thought he’d seen two bigger spiders scuttling away without a backward glance at their offspring. Spiders aren’t particularly doting parents. No, not Brazilian spiders but still (read on) a rare and relevant photo. 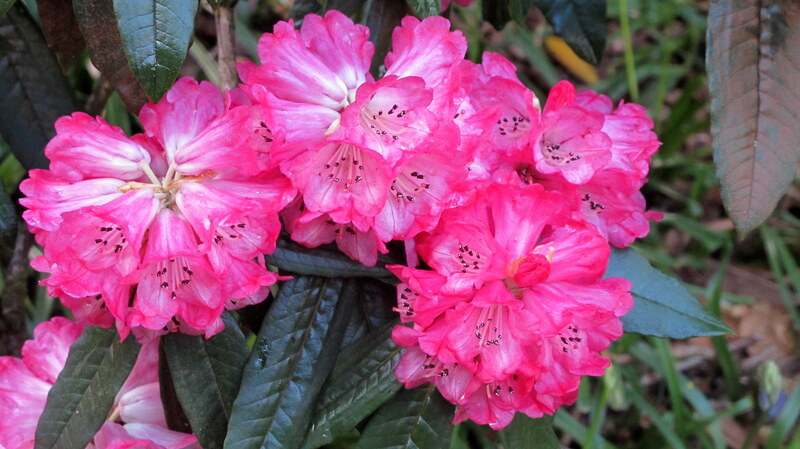 It’s of a rhododendron in bloom. Ooh, is that a spider there on the right? The woman called the RSPCA–the Royal Society for the Protection of Animals–which collected the spiders and brought them to a specialist, who when last heard from was keeping them warm in the hope that more eggs would hatch, even though (or possibly because) when he opened the little pots they came in one ran up his arm. They all seem to be rewording, and sometimes quoting wholesale from, the same press release. Full grown, the spiders measure ten inches from non-existent toenail to non-existent toenail. That is, the papers and the BBC helpfully explain, the size of a dinner plate, although dinner plates vary in size, so you can’t count on them being a perfect fit for yours. In addition to small birds, they eat lizards, mice, and insects. But they like a warm, damp climate and were let loose in a warm, dry one (we’ve had a heatwave and a drought here lately; when that ends, if it ever does or if it has [I write this stuff well ahead of time], they’ll find themselves in a cold, damp climate, which will suit them equally badly), so they may not make it. On the other hand, they may have crawled down to the foot of your bed and be waiting for you to snuggle in tonight. Sorry. I could’ve gone all day and not typed that. Imported species are a major issue in Britain. The place is an island. That means (do I have to explain everything?) that it’s surrounded by water, and often a lot of it. As a result, most non-native species need help to get here. That tempts people to think they can be controlled, but an awful lot of non-native species got all the help they needed a long time ago. We’ll get to that. In the meantime, it’s now illegal to release non-native species into the wild, or to allow them to escape, and it has been since 1981. See above for how successful that’s been. Okay, I don’t really know how successful it’s been. All learned when I tried to find out is that a group of Buddhists released 361 American lobsters and 35 Dungeness crabs as part of a religious ceremony and got hit, in what I can’t help thinking is a secular ceremony, with fines and compensation and victim surcharges that added up to £28,220. Or over £15,000, depending on which source you read. The government does try to stay on top of this and maintains a Non-native Species Secretariat, whose list of non-native species includes everything from the American skunk cabbage to the Siberian chipmunk, not to mention the sacred ibis, the killer shrimp, and the rhododendron. I’ve never seen–or heard of, until now–a sacred ibis. Maybe I don’t hang out at churches enough. But rhododendrons? At least in Cornwall, they’re everywhere, including my backyard. They were introduced into Britain from the Alps in the seventeenth century, and in the eighteenth century, a British collector sent 600 dried specimens home from China. I haven’t been able to find out whether anything grew from his samples or if they just sat around as non-growing curiosities. It wasn’t until the nineteenth century that Britons began importing them from China in serious numbers. That’s about the time that Britain went rhododendron mad, and as a result the gardens of many large estates have endless species of them. One not far from us, Lanhydrock, is now owned by the National Trust and has hillsides of them. They’re beautiful in the spring, and if you come in the back way you, perfectly legally, don’t have to pay the hefty admission price. But those are the fancy ones. Some propagate themselves. A species from Armenia took to Britain well enough that some regions are “overrun” with it, according to an online history of the plant. I’m hoping you don’t need to know when the Armenian one was imported, because I have no idea. What matters here is that they’re not a native species but they settled into the landscape and claimed it as their own. The buddleia, or butterfly bush, did the same thing and now grows along railroad lines, in backyards, in (yes, in) walls, and pretty much anywhere people don’t pull it up. It’s a persistent little beast and it took me about five years to get rid of one that had planted itself in between two bits of paving in my backyard. It was introduced to Europe from China in the nineteenth century, and Defra–the Department for Environment, Food and Rural Affairs–considers it invasive and in 2014 asked gardeners to clip the seedheads after it was done flowering to keep it from spreading any further. Since it will happily grow taller than me and my partner if I were standing on her shoulders, this is a lot to ask. Who am I quoting from there? Sorry–I’ve lost the link. Someone who knows what they’re talking about. Possibly Defra. Butterflies and bees love the plant, and they need all the help they can get these days, but even on conservation sites, where you’d think it would be valued, it can become a problem, squeezing out other plants that butterflies also need. Enough about plants. Non-native birds and animals include the gray squirrel and the edible dormouse, which is more politely called the fat dormouse, because who likes to scurry through the world with edible as part of their name? The Romans introduced the fat dormouse to Britain, and ate them, but they don’t seem to have escaped into the wild until a century ago. A certain number of humans (we are a difficult species, and you could construct a convincing argument that we’re not native to Britain either) get up in arms about the incomers, sometimes for good reason and sometimes just because they’re incomers. What’s a good reason? The fat dormouse can chew through wiring in houses and strip the bark from trees. Mink that escaped from mink farms can force water voles out of areas where they were established. The Chinese mitten crab burrows into riverbanks and may undermine flood defenses. Himalayan balsam grows fast enough and spreads madly enough to smother other plants. So basically, sometimes they throw off the balance of the ecosystem (whatever kept them in check in their home territories is absent here) and sometimes they annoy us. The most annoying of the non-native plants is probably Japanese knotweed, which is so invasive that it can grow through walls, pipes, and pavement. It can damage foundations. It plays rock music at such a high volume that the walls of Jericho crumble. If you own a home and the stuff moves onto your property, the price of your home just bungee-jumped off a bridge, but not necessarily with the bungee attached. You may not be able to sell the place at all, because many companies won’t approve a mortgage if the stuff’s present. Google “Japanese knotweed” and the first things that come up are offers to (a) get rid of the stuff and (b) sue someone for letting it get there or letting you buy the place to begin with. Which demonstrates that the U.S. didn’t copyright the idea of suing people as a way to solve your problems. You can’t copyright ideas, only their unique expression. That’s probably why non-native species haven’t copyrighted the idea of annoying humans. Farmers (to generalize) blame the badger, which is native, for spreading bovine TB and for digging holes that their cattle break legs in. The government–after endless controversy about its effectiveness, never mind its humaneness–has backed a badger cull. The native fox will kill lambs when it gets a chance. Nature is not sentimental. But for some people, being non-native is a good enough reason to get rid of a species. Every so often, a newspaper opinion piece will call for the extirpation of a relatively benign non-native species like the rhododendron, so that Britain can return to the innocence and beauty it had back in [you can choose your century here, because introductions have been going on at least since the Romans ruled the place and probably well before that]. Tear up all the rhododendrons. Eliminate the gray squirrels. Get rid of the butterfly bushes. Off with their heads. I probably hear those voices more loudly than they merit. It’s the paranoia that comes of living in an age when anti-immigrant sentiment is running wild. I can’t help thinking that this urge to return Britain to a time when it was free of non-native plants and animals is related to the myth that there once was, and could be again, a Britain free of non-native humans. At which point this non-native human would remind you that we’re all imports here, and we’re all mixed, and that waves of immigration started at the end of the last ice age and have been going on pretty much continually ever since. Oddly enough, even the most strident voices aren’t calling for the elimination of onions and garlic, which are also non-native. Even though both grow wild. They’re quietly accepted as either British or close enough not to call any attention to themselves. They’ve been here so long that when they write they use a -que when they spell cheque. Spiders have moved into M.’s house, something he’s mentioned because he’s phobic about spiders and even with what he calls the arachnavac he still feels at a disadvantage. Even though he’s in the neighbourhood of six feet tall and none of them even come close. But being in possession of a phobia or two myself, I won’t try to make too much sense out of his. These fears don’t follow the rules of logic, they simply are. But back to spiders: They’re moving into our house as well as his. On an expat forum, I read a comment by an American asking, more or less, “What is it with all these spiders in the shower?” He was in some other part of the U.K., so based on that small and unscientific sample, I’m going to be reckless and say this is a nationwide issue. A few years ago, I read that if you put a horse chestnut in every corner of a room, they’ll keep spiders out. This struck me a vaguely reasonable, since I happen to know that chestnut wood was used in the beams of at least one French chateau because it was thought to deter spiders from building webs. Notice the weasel-word “thought” in that sentence. I didn’t notice it myself when I heard about the beams. I also didn’t—and still don’t—know how closely related the chestnut is to the horse chestnut. Still, when a catalogue slid through my door offering a horse-chestnut scented, spider-deterring spray, I bought a can. And sprayed around the windows most of that summer—or for as long as I remembered and could be bothered, whichever came first, and you can pretty well guess which that was. I spent the rest of the summer sweeping cobwebs off the windows, just as I have every summer since I moved here. But I hadn’t been meticulous about using the spray, so I couldn’t have sworn the it didn’t work. The next fall, Wild Thing and I were in Derbyshire (which in case you’re not British you’ll never guess is pronounced Darbysheer, but that belongs in another post), and horse chestnuts lay around for the taking. And take I did—enough for our house and a different M.’s as well, since she also has a thing about spiders. I didn’t know about the other M.’s spider phobia at the time or I’d have brought home all the horse chestnuts in Derbyshire. Back in Cornwall, I set horse chestnuts in every corner of damn near every room, and M. did the same. It was late fall by then, and the spiders had already moved in, so it was hard to tell if the horse chestnuts worked. Winter came. A mouse came. The mouse found a horse chestnut and thought it had moved into the promised land. The mouse got tossed back outside, without its prize horse chestnut. The horse chestnuts waited for spring, and then for summer, and then for fall, when the spiders get serious about moving in. I wish to report that horse chestnuts do not keep spiders away, and since they make mice very happy I’ve thrown ours out. One particularly big spider lives down a duct that covers a heating pipe, and last winter I got serious about trying to get rid of it and thought I had, but I saw it again last week. Unless it’s another one. If I were arachnophobic, I’d be pretty well phobed out by it. When I lived in the U.S., we never had spider season, and I don’t know if that’s because I always lived in cities (I’m way out in the country these days) or because the parts of the country I lived in didn’t have as many spiders or if the U.K. is some sort of spider capital to the world. If you’re in the mood to comment, I’d love to hear about what it’s like where you are. 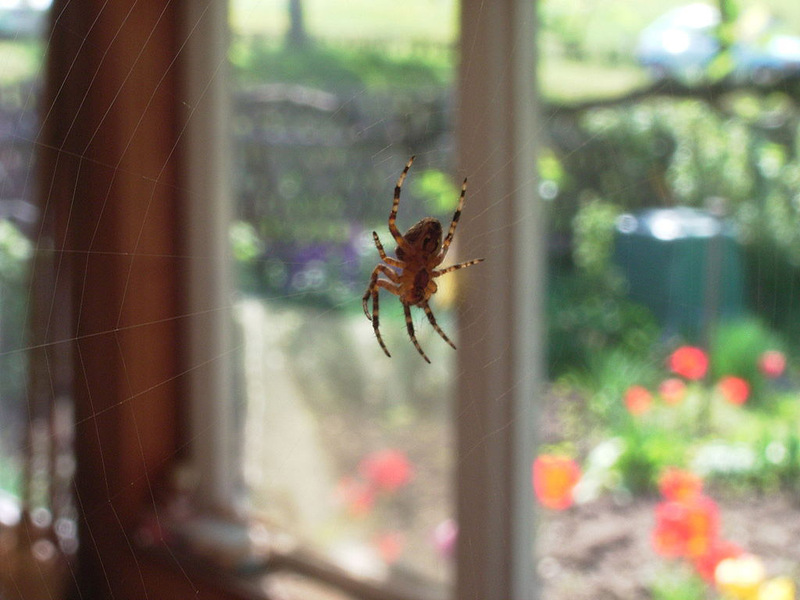 Do you have spiders moving in with you in the fall? Does it happen in cities or only in the countryside? Have you found a way to keep them out?